Wild rabbits don’t hibernate in the winter and their thick coats and active lifestyle makes it relatively easy for them to withstand the cold weather that comes with the autumn/winter months. But domesticated pets still need a snug environment to keep the elements at bay. 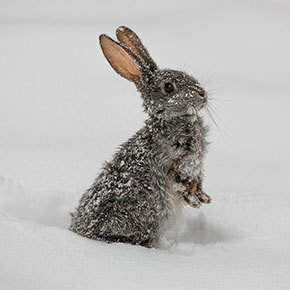 Younger rabbits are more susceptible to the chilly weather but any outdoor-dwelling pet will be grateful for a few tweaks to their environment as suggested by Jürgen Theinert. The following is a list of start points but we have plenty more advice when you contact us at Edgewood Vets. The first thing you might want to do is book your rabbit a winter health check to make sure it’s in tip-top form to deal with the change in climate. Simply call Jessica Ashley and we will take it from there. Here’s our list of basics to ensure a comfy winter for your rabbit. Protect their hutch from the elements – make sure they are well protected from wind and rain by placing their hutch in a sheltered position. Lots of clean, dry straw is a great insulator for your rabbit and they will often burrow in it to keep cosy. You may also want to give them a wooden nesting box full of straw for them to keep warm in. Make sure they still get exercise – it’s essential that rabbits get exercise every day, even during winter. Never keep them locked in their hutch and always let them in their run to exercise. Give them cover – some tarpaulin or other weatherproof material over their hutch and run will help keep them protected from chilly draughts and rain. Check their water – make sure their water bottles or bowls haven’t frozen over and make sure your rabbit always has access to fresh water. It’s essential to keep your rabbit’s hutch clean daily, as sitting in damp bedding can make them very ill. Remember, we’re always on hand to offer help and advice, so please feel free to call if you are unsure of anything or have any questions.